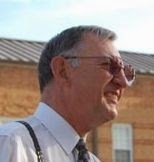 Since 2011, Spencer C. Young has been victimized by the unrelenting nightmare of harassment by a monstrous psychopath that is Ron L. Svaty, a woefully corrupt judge from rural Ellsworth County Kansas, a locale where Mr. Young has never stepped foot in his life ! The below impassioned plea was widely circulated by email, as Mr. Young has heretofore been rendered effectively defenseless against this vicious amoral wayward judge for over three years because Mr. Svaty obnoxiously ignores operative law and the U.S. Constitution . . . as if he is above the law. As noted in the body of this transmittal, Mr. Svaty has purportedly received a bartered pay-off from Morgan Stanley operatives, whereby his express objectives are to: (1) render Mr. Young homeless; (2) arrest Mr. Young on false charges; and (3) eventually assassinate Mr. Young through an arranged "accident". This way, Mr. Young's book, Cannibals In White Shoes - The MorganStanleyGate Exposé won't be published. And should one find the underlying facts in this matter difficult to fathom, just look at how absolutely absurd the actions of this corrupt Kansas judge are, and then consider the even more outlandish linked actions of two corrupt North Carolina officials. 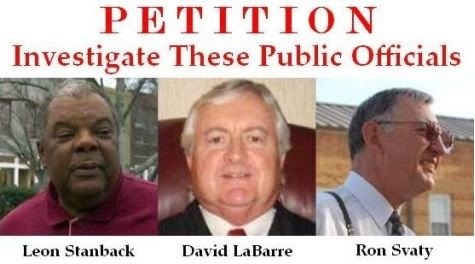 David Q. LaBarre and Leon Stanback are both retired Superior Court Judges of Durham, North Carolina, and long-time friends who were caught red-handed perpetrating extensive felonies and egregious civil rights violations with the same audaciousness as Mr. Svaty, to wit -- as if above the law and fully immune from prosecution. Say what ?!? As articulated in the transmittal, Messrs. Svaty, LaBarre and Stanback are . . .
. . . this being the case because they freely engage in criminal acts and perpetrate civil rights violations under the false guise of legal legitimacy, when in reality nothing could be further from the truth. In fact, this reprehensible trio have been exposed as profound frauds and pathological liars, who are psychopaths, devoid of a conscience, and altogether lacking of a sense of humanity. The crimes that this Trio of Terrorists (Svaty, LaBarre and Stanback) have perpetrated against Spencer C. Young . . .
Should NEVER Occur In America ! And this Trio of Terrorists MUST be prosecuted to the fullest extent of the law, otherwise these criminal bullies who have regularly abused their authority and made a mockery of the public's trust, will only become more brazen, such that their actions will metastasize like a cancer to the US Judicial System and the social fabric of America. 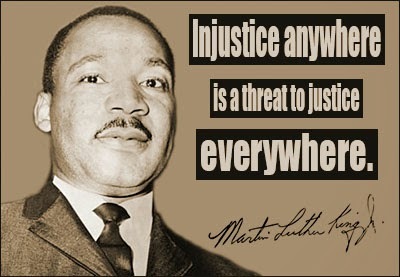 If you consider this to be hyperbolic, consider the relevance of what Dr. Martin Luther King said on this subject . . .
What follows is the widely circulated impassioned plea . . . In the name of humanity, I IMPLORE you to stop this monstrous psychopath Ron L. Svaty, a judge from rural Ellsworth County, Kansas, which is over 1,500 miles distant from where I reside, and a place I have never stepped foot in my life! Mr. Svaty has been unlawfully harassing me since 2011 with a 100% fraudulent paternity claim that is intended to bankrupt me, render me homeless, and eventually used as the basis for an orchestrated assassination, made to look like an "accident”. And I am rendered defenseless! This woefully corrupt judge has purportedly accepted a bartered pay-off sponsored “a few layers deep” (to avoid detection) by Morgan Stanley in a nefarious effort to prevent the publication of my exposé on the MorganStanleyGate scandal, Cannibals In White Shoes, slated for release on January 31, 2015. In addition to exposing Morgan Stanley’s extensive criminal activities, this explosive tell-all lays bare stifling corruption that seems to exists throughout the judicial system of the United States, with justice regularly succumbing to avarice-driven agendas, and this matter is one such example. The latest in Svaty's unrelenting assault has been the bogus garnishment of my bank account and theft of what little money I have. Are you kidding me? How can such a manifestation be allowed in America? And the implications to my ailing 88-year-old mother, who depends on me for what little financial support I can provide, are already becoming dire. And throughout this nightmare, I have been defenseless against Svaty’s incessant unlawful assaults as there appear to be no legitimate checks and balances in place to stop a villainous judge who so brazenly breaks the law. Accordingly, Svaty is perhaps one of the most dangerous domestic terrorists imaginable – as he terrorizes his victims under the false guise of legal legitimacy, and with unrestrained arrogance, as though he is above the law. Mr. Svaty epitomizes the proverbial wolf (i.e., criminal) in sheep’s clothing (e.g., judicial garb). How has this public menace not been stopped? EVERYTHING involved in this bogus matter reflects a complete disdain of, and disregard for civil rights granted by the US Constitution, and operative law (the Uniform Child Custody Jurisdiction and Enforcement Act, or “UCCJEA”). And as I don't have the money to hire an attorney to defend myself against this ridiculous claim, I am a sitting duck to this monster, as Morgan Stanley literally stole my eight-figure net worth. And if I could afford it, it would be money wasted, as it would be a futile effort in corruption-rigged system. This reality became plainly apparent in the outright failure to respond to every one of the multiple ethics complaints filed with the Judicial Qualifications Committee of the Kansas Supreme Court. This stolen property comprised all of my home furnishings from my Chapel Hill condominium (including valuable paintings by Monet and Dali), which was involuntarily placed in storage, after "the worst bank foreclosure fraud in US history", where I was violently evicted via SWAT team on a mortgage that was paid-in-full! Moreover, this diabolical effort included an audacious theft of my Mercedes Benz S320 through an alaborately orchestrated fraudulent conversion. Am I living in America, or some third world country? 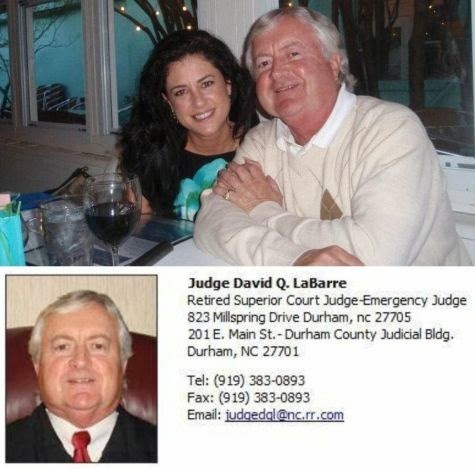 Moreover, in an effort to cover up these and other criminal acts, an equally corrupt Durham North Carolina district attorney, and close friend of LaBarre's (Leon Stanback) had me arrested on an entirely fabricated charge (later dismissed as meritless), incarcerated with the most violent felons and denied bail for 127 days. And during my unlawful incarceration, my residence was ransacked and ALL of my computers were taken via BOGUS search warrant in an effort to destroy evidence against these domestic terrorist public officials. 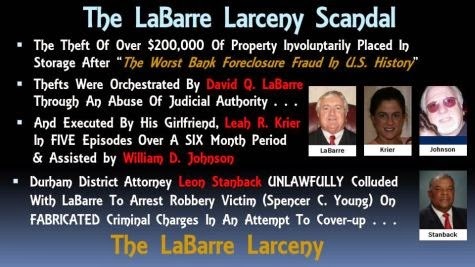 The criminal charges filed against those involved in this LaBarre Larceny Scandal have been ignored at the state and local level. Are you kidding me? Have we somehow entered the Twilight Zone? Worse yet, the criminal charges filed at the federal level have also oddly been ignored. How is that even possible? And what makes this especially disturbing is that these two corrupt judges from entirely different states coordinated their nefarious activities against me and have done so in a diabolical manner such that I am completely defenseless. Now why would these seemingly disparate judges (Svaty and LaBarre) in states over 1,000 miles apart from each other (KS and NC), and roughly 1,000 miles from me (in FL) whom I have never met and who have no valid jurisdictional relevance to me, orchestrate such vicious assaults? As I pointed out, there can only be ONE REASON . 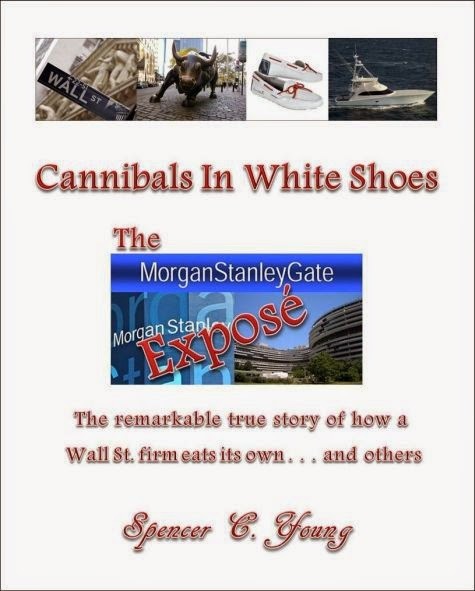 . . the surreptitious sponsorship of Morgan Stanley, in a desperate effort to stop publication of Cannibals in White Shoes. I IMPLORE you to STOP THIS MADNESS!